Fried Potato Bread recipe by Ayesha Razzaque at DesiRecipes.com. 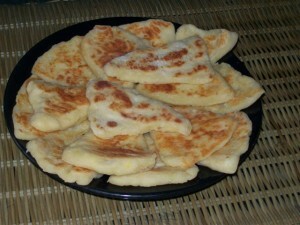 Delicious potato bread in which bread is coated with Spiced mashed boiled potatoes, layered with egg and then shallow fried. Great snack for kidz. Boil potatoes then skin and mash. Mix all the spices and corriander in the mashed potatoes. Put some mashed potato on each of the half bread slices. cover the slice but Dont make a very thick layer. Its according to your taste. Dip the bread from both sides in beaten egg. Shallow fry from both sides till golden brown. serve hot with imlee kee chutnee and ketchup. Great playtime snack for kids. It can also make a great lunch for their school.